Iran’s mullah’s and their despotic regime are celebrating forty years in power. When the Shah of Iran left Iran in 1978 and handed over to Shahpoor Bhaktiar, it was a final concession made to stop Iran’s destruction. 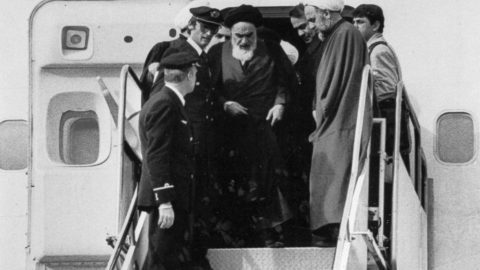 Ayatollah Khomeini was still in France when the world’s most powerful intelligence services decided to facilitate his grim revolution. When the CIA met the Ayatollah in Paris, they told him that the Iranian army would make his objectives unattainable. However, the Ayatollah replied that the people will not be with them and the revolution will continue. At that point the CIA allowed his return to Iran on a chartered Air France aeroplane. Since then Iran has been heading for destruction. This extremism was born with US assistance, and the mullahs proceeded to secure almost absolute power. First: Their colonial attitude towards foreign countries, with interventions in Iraq, Syria, the Lebanon, Yemen and Bahrain, leaving Iran much weaker politically and economically. Iran’s standing internationally is tarnished through terror and aggression. Second: Iran’s intervention in Iraq has the appearance of a state within a state. Iran’s presence in every city and town with Shia citizens in the south of Iraq is obvious to all foreign observers. There’s a common complaint now in Iran that the Revolutionary Guards are sending millions to build mosques and schools in Najaf and Kerbela, two Iraqi cities of huge symbolic significance for Shias, while Iran’s own citizens are dying of starvation and homelessness following the recent floods because the regime withholds resources from its own people. Iran will be transformed by the Iranian people, not by foreign forces. The democratic forces in Iran have the task and duty to change the regime and they should not wait for help from the outside world and foreign powers that have destroyed Iraq and other areas in the Middle East.